I read those 1979 stories all last week, and it put me in a nostalgic mood, so wanted to offer my own memory to add to the collection. 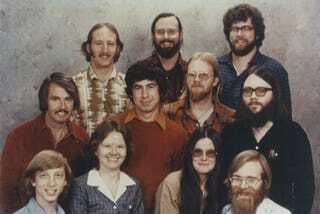 In 1979, Microsoft had 13 employees, most of whom appear in that famous picture that provides indisputable proof that your average computer geek from the late 1970s was not exactly on the cutting edge of fashion. We started the year by moving from Albuquerque back to Bellevue, just across the lake from Seattle. By the end of the year we'd doubled in size to 28 employees. Even though we were doing pretty well, I was still kind of terrified by the rapid pace of hiring and worried that the bottom could fall out at any time. What made me feel a little more confident was that 1979 was the year we began to sense that BASIC was right on the verge of becoming the standard language for microcomputers. We knew this could be the catalyst that would unlock the potential of the PC to democratize computing and create the right conditions for an explosion in programs and applications that would lead to really rapid growth of the PC market. By the middle of 1979, BASIC was running on more than 200,000 Z-80 and 8080 machines and we were just releasing a new version for the 8086 16-bit microprocessor. As the numbers grew, we were starting to think beyond programming languages, too, and about the possibility of creating applications that would have real mass appeal to consumers. That led to the creation of the Consumer Products Division in 1979. One of our first consumer products was called Microsoft Adventure, which was a home version of the first mainframe adventure game. It didn't have all the bells and whistles of, say, Halo, but it was pretty interesting for its time. Back in the 1970s, there was a publication called the International Computer Programs Directory that handed out what was known as the ICP Million Dollar Award for applications that had more than $1 million in annual sales. In the late 1970s the list included more than 100 different products, but they were all for mainframes. In April, the 8080 version of BASIC became the first software product built to run on microprocessors to win an ICP Million Dollar Award. That was a pretty good sign that a significant shift was underway. Today, I would be surprised if the number of million-dollar applications isn't in the millions itself, and they range from apps and games created by a single developer working at home that you can download to your cell phone to massive solutions built by huge development teams that run the operations of huge corporations. More important, of course, is the fact that more than a billion people around the world use computers and digital technology as an integral part of their day-to-day lives. That's something that really started to take shape in 1979. Click to viewThanks for the memories, Bill—please keep us posted on that new beer keg of yours!